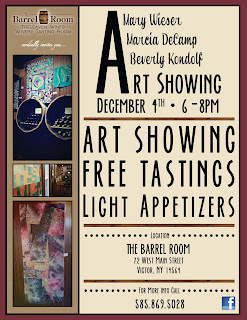 Mary, Bev, and I were on hand for the wine tasting and reception for the art showing featuring the quilts we have hanging at The Barrel Room in Victor, NY. It was a fun evening and great to see several old friends. Joan, Janet, and I went to school together, and it was a nice surprise that they came for the evening.